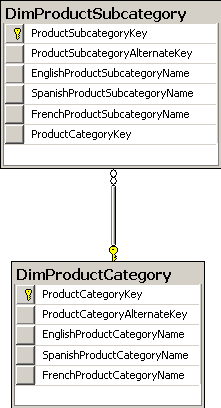 I prefer to use the [DimProductCategory] and the [DimProductSubcategory] tables. Let’s look at the relationship between them. 4. Click the New external content type, enter a name, press the Tab button, the Display Name should be filled automatically. Finally, click the Click here to discover external data sources and define operations. 5. In the Operations Design View, Click the Add Connection button. 6. In the External Data Source Type Selection dialog, select SQL Server and then click OK button. 9. In the All Operations dialog, click Finish button, you will see those operations in External Content Type Operations section. 6. In the opening window, enter your domain user, click Add button, give all permissions to him/her and then click OK button. If you click the query result, you may get the following error. The reason is IE doesn’t know how to display the data with bdc3 protocol. Fortunately, the BCS option support a nice feature names Profile Pages which we can use it to look at the query result. 2. Select the Blank Site, enter the title and the URL, then click Create button to create the site. Copy the URL. 6. After the window closed, check your content type, and click the Create/Upgrade button from ribbon -> Profile Pages. Click OK button to finish the action. 7. After the creation completed, click the OK button to close the window. 8. Re-crawl your content source, after it competed, go to your FAST Search Center site, enter a keyword, you will get the result. Click the link, you will see the profile page. Please refer to another article to resolve this issue. I followed the same steps which you have mentioned above for BCS Search.I dont have view in my database so, I clicked on the table and created all operations. I am able to search the data but,the URL is still bdc3://. I created a profile page but still my search results are pointing to bdc3://.Could you please help me in solving this problem. After you create the profile page, did you re-crawl the data?